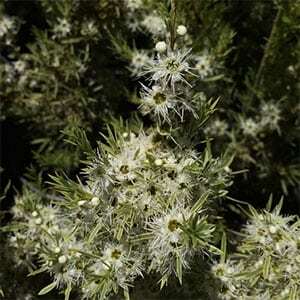 A small tree masses of white flowers in spring Kunzea ericoides is also known as the White Tea Tree as well as Burgan. This is a tall growing species that can reach over 8 metres in height. The more compact forms that will reach around 1m in height such as K. ericoides ‘Snowman’ are more widely used as garden plants than the species itself. A large white flowering species Kunzea ericoides is perhaps the most cold tolerant of the species. Reaching to 6m in height depending on conditions, like its relatives it has scented foliage and masses of flowers form spring tp summer. Used in landscaping to help revegetate or reclaim degraded areas. It requires little attention once established. Also known by common names as the ‘White Tea Tree’, ‘Burgan’ and ‘Kanuka’. This species is tolerant of a range of conditions from frost to extreme heat, it copes with low water and requires little fertiliser although it will resound to a low phosphorous type in the first few years. Due to its ability to spread, in fact it is regarded as invasive in some areas, and the volatile oils in the foliage Kunzea ericoides is not recommended by some councils and CFA brigades for planting close to houses in bushfire prone areas. Height – To around 8 metres.